This black formal vest can be used for a number of different costumes including tuxedos, suits, barbershop quartets, or Daddy Warbucks in “Annie.” The vest features decorative gold buttons, front pockets, and lapel collar. 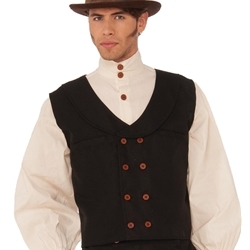 The black formal vest is colored as pictured. Vest is one size fits most using adjustable ties and strap across the back.